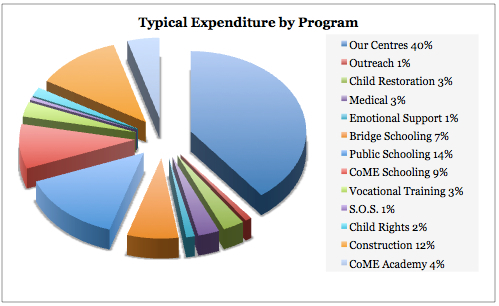 At Children of Mother Earth, our resources and efforts are directed towards the major Programs listed below. Click on a menu link at left to read more about a specific Program or step through each Program using this Next Program link. Reaching out into the community, building trust with street-children, parents, police and other stake-holders. The day-to-day managing and running of our centres for the children. To re-unite street-children with their families, wherever this is possible. Providing urgent medical care and attention, as well as attending to the day-to-day medical needs of the children in our care. Attending to the emotional and spiritual needs of traumatised street-children. Providing informal, in-centre education and functional literacy to street-children as well as counselling them and their families, so that they can join the mainstream school system. 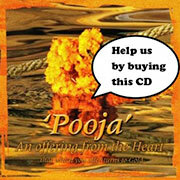 Sending as many of our children to Government schools or local private schools as possible. The staffing and running of our own 2 small schools in areas where we consider the local schools to be inadequate. Career guidance, counselling and specialised training of our teenagers in their chosen path, and helping them to find a job. Bringing awareness of children’s rights and obligations to children in need, and to public officials dealing with them. Emergency humanitarian help given in the community when required, and if possible. Constructing and maintaining the buildings and grounds under our control. Our vision for vocational education for India’s under-privileged children. Take a guided tour through our Programs using this Next Program link. You can also see Our Finances where annual expenditure is split by type of expenditure. less than 50% of females (age 14-16) attend a secondary school. From our experiences and the fact that nearly 60% of the entire population in India has no birth registration, the real numbers are probably much higher, and a greater number of people are living in impoverished conditions. Although it is difficult to get an exact number of street children due to their mobility, it is estimated that 18 million children live on the streets in India. This website is developed and maintained by volunteers who love and support Ravi Rai's beautiful vision.